In a large bowl combine the cumin seeds, ginger paste, garlic paste, cayenne pepper powder, black pepper, and grated radishes and scallions. Add the flour and salt and mix well until any water is absorbed. Add a few tablespoons of yogurt at a time, and knead a little each time before adding more yogurt. The finished dough should be firm but not hard, moist but not wet, and slightly firmer than modeling clay. It may be slightly sticky. Cover until ready to roll. Divide the dough into golf-ball-sized pieces. Using the palms of your hands, roll each piece into a smooth ball and lightly flatten to make 1″ diskettes. Keep covered to avoid drying. Roll these out similar to rolling a tortilla (or use a tortilla press) without dredging in the flour after the first dredge. As you begin, dredge only the diskette you are going to roll in the dry flour and dust off any excess. Work on a flat, dry rolling surface. Using a tapered rolling pin, gently roll out the dough using light pressure from your fingers (not the palm) to spread the dough. Roll outwards but not over the edge, until it is about 6” in diameter. Lightly dust off the finished uncooked paratha. To cook, heat a shallow nonstick pan on medium-high heat. Reduce the heat to medium and transfer the rolled uncooked paratha to it. The dough will bubble slightly. Move it around in the pan without flipping it over to so that all parts of the paratha cook evenly. Approximately 1 minute later, turn it over. The first side should be lightly spotted but not have dark spots. If you see dark spots, reduce the heat. Repeat on the second side. At this time, lightly baste the top of the paratha with ghee, flip over, baste the second side, and cook both sides until they begin to show tan-brown spots. Both sides should have ghee, and be cooked once without ghee and once with ghee, and there should be no doughy spots. Remove from heat and cover with a paper towel or a colander to let the steam evaporate. Lightly wipe down the pan to remove any burnt flour or excess ghee before starting on the next one. 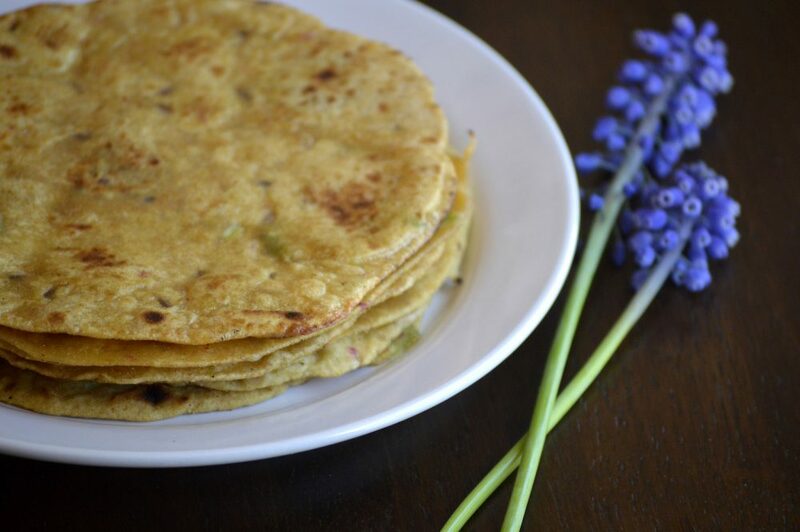 Once they have come to room temperature, the paratha’s can be transferred to an appropriate storage container and stored in the refrigerator for 2 days. To warm them, wrap them as a stack in foil and place in a warm oven for 20 minutes, or warm individually on the griddle.